Roy Lichtenstein, Brushstrokes, 1996, painted aluminum, Gift of Prudence M. Miller and her Family, © Estate of Roy Lichtenstein. Photo by Don Urquhart. Welcome to the SAM@PAM series on art conservation—where Science and Art Meet @ the Portland Art Museum. In this post you’ll learn what it takes to preserve painted outdoor sculpture. Conservation treatments, or interventions that prolong the life of an artwork, are typically carried out behind closed doors at the Portland Art Museum. The conservation lab provides a controlled setting for intricate and steady work. Lighting, temperature, and materials are arranged and prepared with precision ensuring that the treatment of priceless artwork is carried out with forethought and the utmost care. Some works, however, are larger than the doors of the museum and must be maintained outdoors. 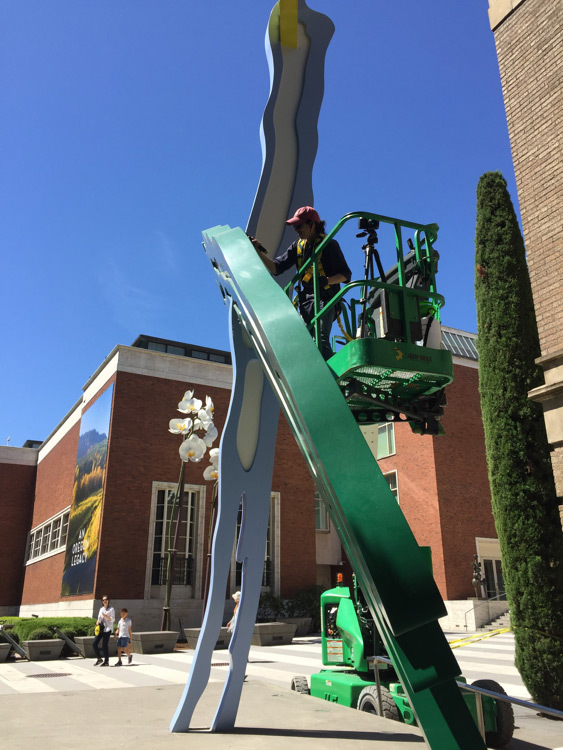 Brushstrokes by Roy Lichtenstein stands as a beacon of Contemporary Art announcing to visitors in the park blocks what lays in store within the museum’s walls. The work was fabricated in 2003 from painted ½” aluminum plate by Pollich Tallix in Beacon, NY and then shipped to Portland. It was installed to coincide with the 2005 opening of the Center for Modern and Contemporary Art in the Mark building. The paint on the sculpture has taken a beating from the sun, rain, hail and occasional bumps from passersby. Just like the paint on your house or car, the paint is degrading and over time has developed cracks, flaking, and losses allowing water to get to the aluminum below. While the cracks and peeling areas are not visible from the ground, they allow water and dirt to creep under the paint layers that can accelerate corrosion of the metal. The year-long preparation process for this work involved consultations with the curator, artist’s foundation, other conservators, and a paint manufacturer, planning the procedures, selecting and procuring materials, equipment rental, schedule coordination, and last minute adjustments. This resulted in three full days of active work on the sculpture, two of which were spent high up in a bucket lift. Many of the materials used are those common to auto-body repair. The paint, however, is more complicated. Unfortunately, it is not just a matter of getting more of the original paint. One reason is that some of the paint is no longer manufactured. Another reason is that over the past 14 years the paint has changed color and changed color unevenly, becoming chalky in places where it gets the most exposure to sun and rain. The original paints just won’t match. After much investigation, a new paint system developed by Golden Acrylics, and still in trial, is being given a real world test. Golden’s standard artist acrylic paints can be used to mix and match as needed. Then additives to increase the paint hardness and reduce damage from UV light are incorporated. This should allow the repairs to last several years, rather than weeks. In addition, the materials are readily reversible when they need to be replaced. As a conservator, I work towards preserving original materials and keeping intervention minimal; however, outdoor sculpture’s exposure to the elements requires a more invasive approach. In this case, to prolong the life of the aluminum and the overall coating, any paint not well adhered to the surface was removed. The areas were then cleaned, coated with a primer and corrosion inhibitor, filled to create a smooth surface, and then painted to match the surrounding surfaces. If you are interested in learning more about conservation at the Portland Art Museum, visit the conservation pages on our website and keep an eye out for more SAM@PAM posts on social media.